Google didn't use the opportunity to showcase its self-driving car at I/O this year, but Android Auto still had a presence. In fact, Hyundai was on-site to demo a prototype app that should ship "before the end of the year." 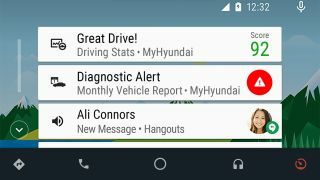 MyHyundai is an OEM app that operates inside of the Android Auto interface, enabling the automaker to run its own apps on the side. Hyundai was the first auto manufacturer to ship Android Auto-equipped cars, and it'll soon be the first to add embedded extras to the platform. At launch, it'll allow drivers access to one-touch Hyundai Roadside assistance, a Monthly Vehicle Report, and a Valet Mode. You'll also be able to peek your last trip and call/navigate to your nearest dealer. I asked an on-site spokesperson if Hyundai had plans to integrate a more elaborate trip tracking feature – something akin to Land Rover's InControl Protect – for those who need granular data for expense and reporting reasons. I was told this wasn't yet on the horizon, but the mere existence of MyHyundai means that it's possible for the company to tack on extras as it evolves.